The summer after third grade my mom forced challenged me to read the entire Laura Ingalls Wilder series. Little did she know she was making a reader out of me. From that summer on, for years you could rarely find me without my current novel nearby. My husband, well he was about the same. I like to think he was more nerdy than me. He would read an entire Lord of the Rings book in a weekend but a reader nonetheless. So if Clara girl is anything like her mommy and daddy, I’m sure she will be a reader too. So of course she needed some bookshelves for her fast-growing book collection. 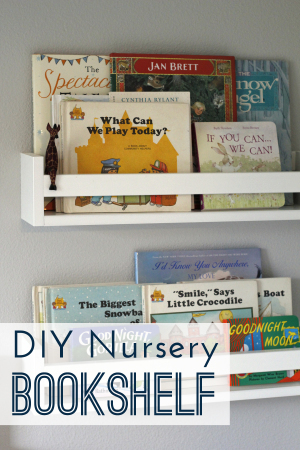 One Saturday before she was born my brother-in-law was over and I happened to mention I still wanted some bookshelves made for the nursery. Within a few hours materials were bought, cut, nailed, and paint was drying. Win!! And they’re super easy to make that anyone with a few power tools can do it! 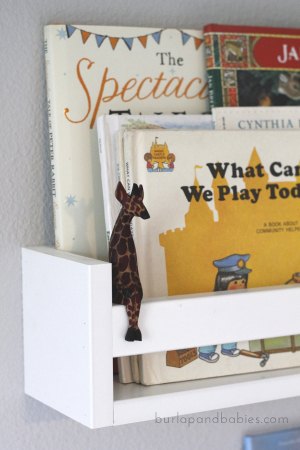 We used these Pottery Barn bookshelves as inspiration, and aren’t they just gorgeous?! 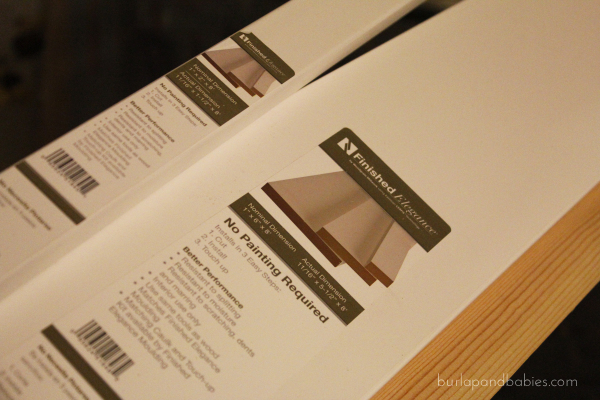 We found finished elegance wood that requires no painting at our local hardware store. The only spot we had to paint was the raw edges that were cut. Four inches wide and six inches tall with a two inch piece on the front and back. And of course we had to add a little giraffe into the mix to add into the theme of our purple giraffe room. Super quick and easy and done in an afternoon. What do you think? I would love to see what fun, diy projects you’ve been up to lately. Come link up to our latest Motivational Monday party that is live Sunday through Thursday. And check out this photo of our shelves taken by our amazing photographer and friend, Nakalan McKay. Love it! Affiliate links may be used in this post. Ordering a product through this link may result in a commission, which helps pay for the cost of running this site and keeps the content free. Read my full disclosure policy for more details. I just recently painted the Ikea spice racks (I’m sure you’ve seen the idea on Pinterest) that look sort of like this and I am soooo anxious for my husband to hang them in the play room!! 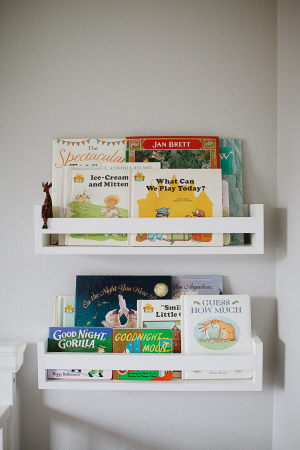 Your bookshelves look really great…my hubby works for Crate and Barrel so I luckily get to be a snobby Land of Nod mama, but your shelves look just as amazing….way to go! These look great!! Jade is already a total lover of books. She’s always asking us to read her the same one….over and over. ;) I love how cute these are on the wall!